With four consecutive family weddings, I haven’t had much time to post any new recipes. But rest assured, we had plenty of good food at the weddings. I also stuck pretty much to spicy south-Indian curries and lots of rice for meals at home with our visiting family. But we’re all done now and I thought I should really start cleaning out my system with some lighter meals. To start, here’s a simple tasty salad. Whisk together the dressing ingredients. Flake the tuna into the dressing and mix well. Add salad vegetables and stir well. 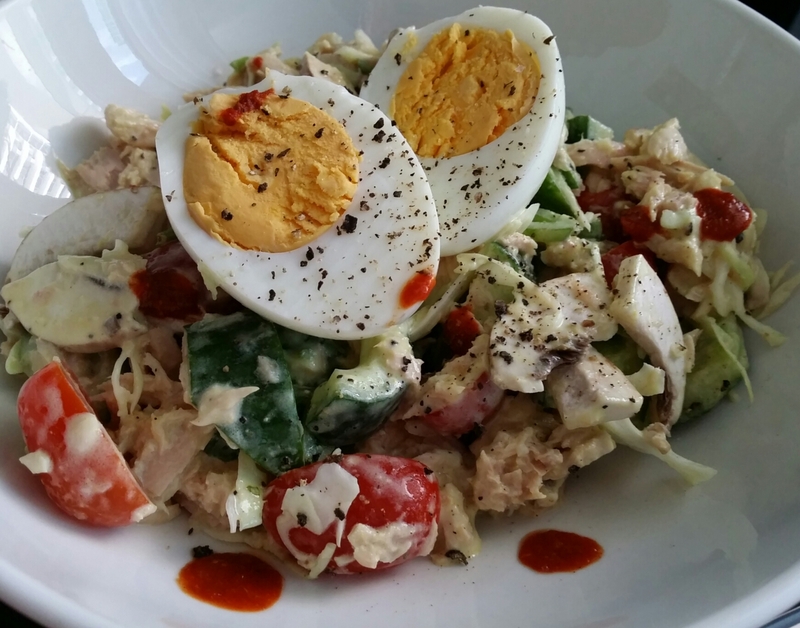 Top with hard boiled egg. Sprinkle additional salt and pepper on top. I also drizzled some Sriracha sauce on top for an added kick. Enjoy!